We just updated the main menu over the weekend so if you have purchased the Sakura Grove expansion set, you now have access to the hot-seat multiplayer versions of the expansion modes as well. 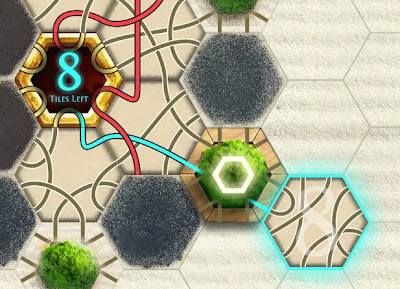 To make things interesting in the Sakura Grove mode itself, you do not receive a tile for each pass through a cherry tree; rather, it takes two passes for a single tile, which allows you to "steal" bonus tiles from your rivals before they are able to make the second pass. To access the new multiplayer versions of the expansion set modes, login, and then click "Multiplayer" on the main menu and you will see a new listing of the modes to choose from. Choose the one you want to try, and then select the number of opponents. 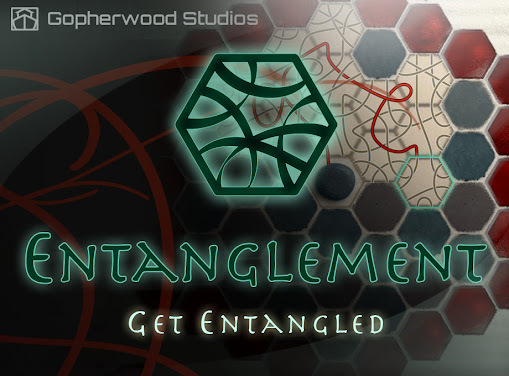 If you haven't played Entanglement recently, you may need to refresh the page to get the latest version of the app. If you haven't activated the Sakura Grove expansion set and want to, go to the main menu and click "More Modes". Up next: the Daily Challenge mode. Lavender: temporary color for extensions of paths leading to walls or to the central hexagon as the current tile is rotated. Players who find such features to be crutches for the weak can turn off coloring all together, and those who (like me) find the strategy to be the most compelling challenge can turn them on. Thanks for the suggestion - I've had a few other folks mention similar ideas. We'll take it into consideration as we continue developing it! That would be a great feature for us beginners! I'd love to see an option for online multi-player with friends. And perhaps a friends only scoreboard. I don't get any hover clues or tile rotation on the latest versions of Chrome (Just found your game so I don't know if this is an existing problem or just me). I've tried Chrome 10.0.648.133 and Chrome Beta 10.0.648.133 on two different computers. Works in FireFox on both computers. Glad you're enjoying it! We agree with you - both of those are on our list of possible pursuits. I have heard of a few folks having this problem, but it's usually due to a conflicting browser extension. Try temporarily disabling your browser extensions and see if Entanglement performs better. If not, let me know!